Before the impending rapture hits! That's right it's the Old Navy annual flip flop dollar days sale this Saturday....May 21st. Here is their really cute Flip Flop Video. That's how I'm gonna wear my flip flops from now on! 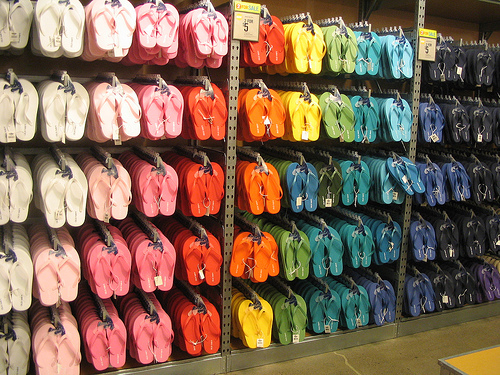 If you miss out on Old Navy's sale, you can always go to Payless Shoe Source for same hot hot fun flip flops. Here's a printable coupon just for you. Ckick on it to enlarge. One flipping dollar. WOW. I should try to go there. We don't have too much to do tomorrow on the last day of the world : ) Kaish has acting. I have a party to shoot at 3:00. Hopefully I can finda minute to stop in and get some cheap flops. I am going to watch the video now. WoW! The only time I really wear flip flops is at the pool and then in the shower at the club...and my cute orange ones with cherries do just fine there....but who can resist a deal like that! It's May 21 and I'm still here. Not sure what that means, but I'm happy about dollar flip flops. Thanks! I surely missed this big sale...OY. It would be really bad in the world ended and I had on old janky flip flops. It's a good thing I didn't see this until now since I am known as the flip flop junky in my family. I already bought three pairs this season and I don't know where I would fit anymore. None of them cost a dollar though.